One of the unique features of the course is simply what’s not there! The beautiful rolling terrain, native vegetation, lakes, streams and flowers that line our fairways are only bordered by unspoiled countryside and local vineyards! No towering hotels or condominium projects. No villas lining the fairways. Nothing but the natural beauty of the Algarve framed by the majestic Monchique Mountains in the distance. With 5862 meters (6411 yards) from the back tees, this is a strategic layout that demands careful thought and shot planning rather than brute force to get the best from your round. 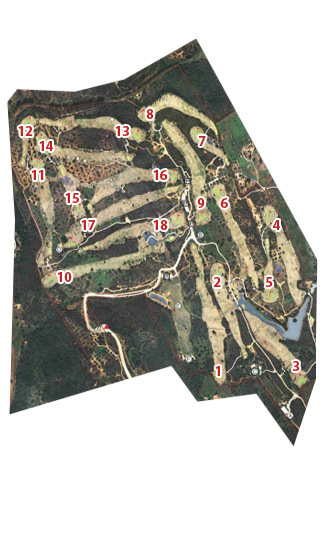 The rolling hills and frequent doglegs mean you’ll need to work the ball both ways. And from the moment you step out on the tee box, you’ll experience a sense of awe at the beauty of the layout before you. Tree-lined fairways are both tight and forgiving. 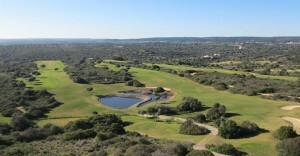 From the fairways, the course at Espiche requires a deft touch with your short game. Bunkers guard most greens while the greens themselves are large and undulating, demanding a soft hand with the putter. Espiche is a challenging yet fun layout: a shot-maker’s course where you’ll enjoy an amazing variety of holes not found on most courses. The par five 1st hole, dropping some 80 feet from the tee before rising back to the same height at the green, gives you some idea of the views and challenged to come. The 3rd provides the sternest test on the front nine at 409 meters uphill all the way before the short seventh and eighth offer birdie opportunities. The par five tenth is surely one of the finest in the Algarve and, while you may be tempted to go for the green in two, the fairway gets progressively tighter as you near the green. The risk-reward nature of the course is apparent on many holes and you’ll always feel you left a few out there to be improved upon on your next round. You’ll relish every shot and every hole as you enjoy golf in the Algarve the way it was meant to be experienced: on a fun and challenging course that takes full advantage of its picturesque setting.